This listing offers a range of office suites, suitable from 2-100 people. The units are modern and offer high quality office space. The units all have access to kitchen and toilet facilities. There is plenty of on-site car parking and great road connections. The M40 Motorway provides direct access to London. There are many local amenities located a stone's throw from the office space, giving a variety of options to grab a quick lunch. 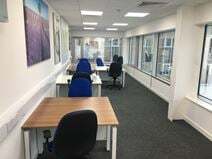 This centre offers comfortable workspace with a modern feel in Banbury town centre, just off the M40. Both serviced offices and co-working space is available on a furnished basis with dedicated kitchen and rest room facilities. 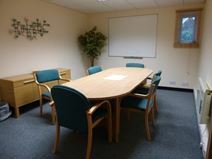 The centre is equipped with two meeting rooms which can accommodate up to 20 people, and high speed Wi-Fi. This centre is surrounded by local amenities and is easily accessible by bus and train. This ideally located office suite can provide you with a great platform for you and your business to flourish. With meeting rooms, personalised space and flexible terms, this office is perfect for any aspiring business. Alongside this you'll find ample parking available, with 24 hour security to ensure your on-site safety. There is also further options for your own storage rooms if you wish. The location of this suite is perfect, being easily accessed by car, public transport and excellent cycle routes! Close by you'll find an abundance of local shops and amenities for your leisurely activities. There is also a large green park nearby where you can talk a brisk walk into the town centre. A selection of first-class offices are available to let in the heart of Banbury. Refurbished to a high standard and decorated with great attention to details, these offices can be let furnished or unfurnished according to your needs. A wide range of services and facilities can be provided in order to offer a highly efficient and professional working environment. They are surrounded by a variety of amenities and are close to the railway station. This is a 'hit the ground running' office arrangement with small offices ready furnished and equipped for immediate occupancy. 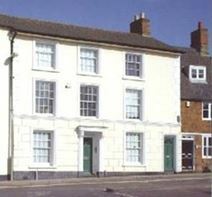 The centre, a converted Victorian building is just next to Banbury Cross, a mainly commercial area just a few minutes’ from brand new shopping facilities. The office accommodation is tailored for ease and convenience with minimal start up costs, clear inclusive agreements and flexible terms. The space provides a range of great services including 24hr security and meeting facilities.